In A Place for Wonder, Georgia Heard and Jennifer McDonough discuss how to create “a landscape of wonder,” a primary classroom where curiosity, creativity, and exploration are encouraged. For it is these characteristics, the authors write, that develop intelligent, inquiring, life-long learners. The authors’ research shows that many primary grade state standards encourage teaching for understanding, critical thinking, creativity, and question asking, and promote the development of children who have the attributes of inventiveness, curiosity, engagement, imagination, and creativity. With these goals in mind, Georgia and Jennifer provide teachers with numerous, practical ways—setting up “wonder centers,” gathering data though senses, teaching nonfiction craft—they can create a classroom environment where student’s questions and observations are part of daily work. They also present a step-by-step guide to planning a nonfiction reading and writing unit of study—creating a nonfiction book, which includes creating a table of contents, writing focused chapters, using “wow” words, and developing point of view. A Place for Wonder will help teachers reclaim their classrooms as a place where true learning is the norm. Georgia Heard is a nationally and internationally known leader in the field of teaching writing. She was one of the first staff developers at the Teachers College Reading and Writing Project in New York, and for the past twenty-five years has visited schools and spoken at conferences throughout the United States, Canada, and Southeast Asia. Georgia received her bachelor's degree in history from American University and her master of fine arts degree in writing from Columbia University. "My mother was the librarian at my school, so I always spent time in the library," Georgia remembers. "When I went to Columbia University to study writing I realized what a gift it would be to be able to help other writers." She says that she enjoys helping other people find their writing voice, especially children who are curious about how the world works. Georgia lives in Singer Island, Florida, with her husband and son. "Moving from NYC to Florida was a transition but now I live on the ocean and we are finally settling in. We walk every morning and evening on the beach where we keep an eye out for hatchling turtles and ghost crabs. We frequently kayak and swim, and try to avoid hurricanes." Jen McDonough is a first-grade teacher and literacy coach at the Benjamin School in North Palm Beach, Florida. She has taught first grade and kindergarten for ten years and has been a part of literacy training for teachers for more than three years. She received her bachelor's degree from Western Michigan University and her master's degree from Florida Atlantic University. "Teaching found me," Jen says. "My goal was to work with kids because I knew that I connected well with them and they responded to me in a positive way. I studied speech pathology but had a hard time getting into graduate school, so I started teaching and haven't looked back." Jen says that she especially loves the process of getting to know kids and watching them become amazing readers and writers. "The kids' enthusiasm for the world around them keeps me in awe of the natural world and curious. This is one of the only jobs I know where you go to work and someone is constantly telling you how special you are. It's a good place to be!" Of working with Georgia Heard on their book, Jen says she feels lucky "to ride on the greatness of Georgia Heard. She taught me how to be patient, work hard, revise, and create deadlines so writing was actually completed. Georgia taught me that teachers have really good ideas and that anyone can write a book if they believe in what they have to say and are dedicated to getting it on paper." 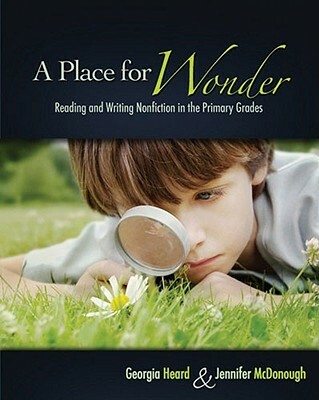 In A Place for Wonder, Georgia Heard and Jennifer McDonough have created a text to guide educators of young children in establishing “wonder” in the classroom. The text is divided into three main sections: Creating a Won­der World; Nonfiction Writing from the Heart; and Nonfiction Research Wonder Writing. In particular, the first section of the text contains many use­ful tools for creating a sense of wonder in an early-years classroom. Included in these pages are sample letters for home communication, recommended book lists, student observation and recording sheets, how-to information and the authors’ personal reflections. However, the later section that pertains to research is light on the actual research aspect. The reader needs to be cognizant that the authors’ focus is on non­fiction writing, and not on inquiry. All in all, this is a strong text to assist educators in their quest to instill a sense of wonder and encourage students to question the natural world around them.